For my birthday last year my husband bought me a beautiful book called Bouchon Bakery. It is the sort of book that you would first think to put on your coffee table, before considering it for it’s actual purpose as a recipe book. This is probably why I haven’t used if until now. To be honest it’s just too nice to mark with greasy finger prints, to stain with cocoa powder or food colouring, and I would physically weep if I warped any of the pages of stunning baking based photography with an egg based spillage. However, I have the urge to try something new, and this book has a whole section dedicated to macarons – those pretty meringue biscuits sandwiched together with fruit and/or buttercream. I also have a bag full of blackberries, picked by the girls from a nearby hedgerow, that are itching to be used in something a bit more original than a crumble (although I might just have to save some for one of those for Sunday lunch ). I have a vision in my mind & I’m hoping the Bouchon Bakery might help make this a reality. The ingredients are specified in grammes, but also in cups. Nervous that there could be an American styled spanner in this recipe I made sure I read ahead to avoid any unexpected curve balls half-way through the bake. I also double checked it against other recipes I have in John Whaite Bakes and also GBBO Showstoppers to make sure all was above board. I’ll try and post a recipe once I’ve had a couple of goes and I feel I know what I’m doing. I started off by blitzing ground almonds together with icing sugar in a food processor to make it as fine as possible, and then passing the dry ingredients through a sieve. I then moved onto making the meringue mix – beating together egg whites to loose peaks i.e. just past the foaming egg white stage and just before the soft peak stage. Meanwhile I heated caster sugar with some water to 120°C which I then gradually trickled into the egg whites whilst beating on high speed. 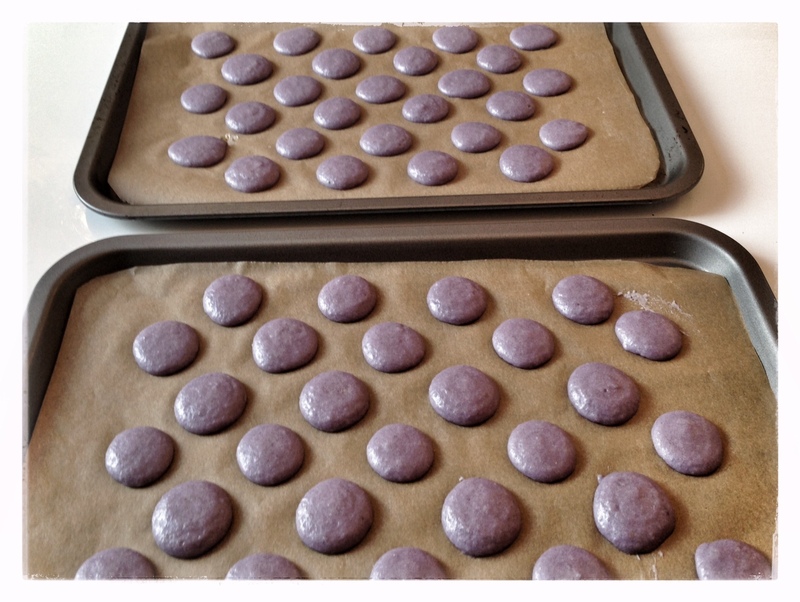 I also added some ‘violet’ colour paste (applied with a cocktail stick to the mixer blade) to give the macaron shells a vibrant purple colour. I beat the whites so that they went through soft peak to stiff peak at which point STOP! The science behind the meringues (at least what I’ve read) is that eggs are mainly made up of water and protein. Beating the whites causes a) air bubbles to be created in the water; and b) the protein molecules to open up and a form a network which holds the air bubbles. This is why you always need to use a very clean bowl and utensils to make meringues – any fat residue, or escaped egg yolk, prevents the proteins from forming the solid network, and then it can’t hold in the air. However, you can have too much of a good thing as they say, and if you beat the egg whites too much, you will reach a point where the protein network starts to break down and release the air bubbles. Apparently, by adding sugar you make the network stronger, which means you can beat in more air before this breakdown starts to happen. Next step was to combine the meringue mix with the dry ingredients through the process of ‘macronage’. This means gently folding the meringue into the dry ingredients with a spatula (once round the outside of the bowl and turn/fold in, once through the middle of the mixture and turn/fold in, and repeat) until it is all combined. I believe that the batter should become a lava like consistency – not too thick otherwise the bubbles will get trapped in the macaron causing it to burst when baked; not to thin otherwise the macarons will just spread out and not hold their shape. I had previously prepared 3 baking sheets with parchment and had drawn around a ten pence piece as a template for piping out the macarons. I gently spooned the batter into a piping bag with a 2cm nozzle & piped the mix (holding the bag upright) onto the tray so that it just filled the 10p sized circles. I then banged the tray 4 or 5 times to release any trapped air and left for the next couple of hours (whilst I took the girls to a party) so that the macarons developed a shiny skin. 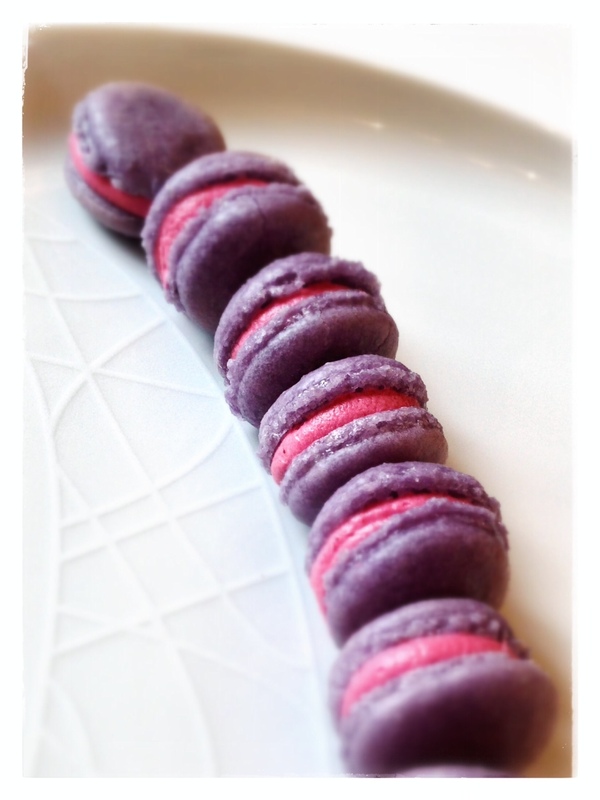 Before putting the macarons in the oven I made the blackberry buttercream filling. I heated up 150g of blackberries along with a couple of tablespoons of water for about 10 mins, until the blackberries started to breakdown and release their juices. I then passed the resulting sludge through a sieve. Next I beat together 1 part unsalted butter to 3 parts icing sugar to a light and fluffy consistency before pouring the blackberry juice and continued to beat until it was all evenly coloured a dark fuschia pink. A good job I had prepared 3 trays of macarons as the first tray started browning before even 5 minutes of baking was up – looked more like chocolate macarons by the time the bake was complete. I turned the oven down 10°C and tried again with the next lot. It got to about 7 minutes before they started browning – not as bad as last time, but still not good. I went extreme with the last batch turning the oven down a further 20°C to 140°C. I just managed to complete the bake before they started to turn. On the plus side they were consistently sized with shiny coats and decent ‘feet’. I left them to completely cool before peeling them off the parchment. I found that to peel the paper off of the macaron rather then peeling the macaron off the paper worked best. I then piped a big dollop of buttercream onto every other macaron before sandwiching together to make the perfect mouthful. Regardless of the appearance the family wolfed the whole lot down (bar five) in about 15 minutes so I’m guessing they tasted alright too.